Ho Ho Ho! Book Your Holiday Party DJ Now! Looking for a Holiday Party DJ? Looking to make your next holiday home or office party really rock? Then hire a top rated Chicago DJ to entertain your guests, and you’ll have them talking about your awesome holiday party right on through to the New Year! Chicagoland DJ Services, your Holiday Party and Corporate Event DJ specialists, still have many key holiday dates available for your next party or event. But these dates will go fast, so contact your Chicago Party DJ today at 708-320-9693 to book your next event. Plus, our extremely popular and affordable Chicago DJ Packages are available even during the holiday season! 5. Send out your invites as far in advance as possible. Make sure to utilize facebook invites and other online group invite tools and don’t hesitate to send out reminders. With so many holiday parties to compete with, you want your guests to commit to your party first. 4. Make your holiday party a hit with a theme and prizes! Try an ugly sweater party theme, and have your guest all show up with the worst looking holiday sweater they can find. The more gaudy the better! Make sure to give out a prize for the best of the worst. And instead of a pricey gift exchange, try a white elephant gift exchange. So you can re-gift some unwanted gift… or wrap up some funny item lying around… and have a good time seeing who gets stuck with what. 3. Party food – keep it simple. Think pizzas or crock pot food that can take care of itself. Don’t make too many sides, as most guests like to bring a dish or desert. 2. Holiday spirits. Make sure to figure on enough beer, wine, and hard liquor for your guests. And don’t forget the mixers and plenty of ice. Just make sure not to over serve. And offer those who’ve had too much, to stay the night. Make it a good old sleepover just like when you were a kid…. minus the booze! 1. Music. The number one most important factor in a memorable holiday party is the music. Make sure to mix in your holiday favorites with some party music, since most of your guests will be on holiday music overload everywhere else they go. 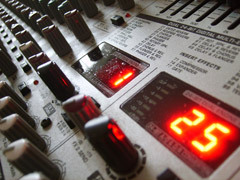 Hiring a quality holiday party DJ to take care of the entertainment is a great idea too. A Karaoke DJ is even better. 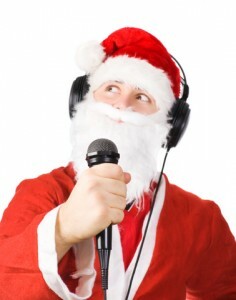 From your guests singing christmas carols, to santa singing Santana, karaoke at your holiday party is sure to be a hit!